This year will be remembered for various reasons; most importantly, though, because we lived to see it despite the doomsday prediction by the Mayans, a fairly accurate lot otherwise. Thank god this happened, because otherwise we wouldn't have witnessed the birth of affordable luxury. Today, even the top luxury car manufacturers in India are aiming at making cars more affordable. Quite a few entry-level luxury cars have been launched so far, with more expected soon. The newest kid here is the 1 Series, which is also BMW's most affordable car in the country today. But is it worth considering for someone who's entering the world of luxury? To find out, we have brought along the Mercedes B-Class. Both cars look completely different and are unique in their own right. 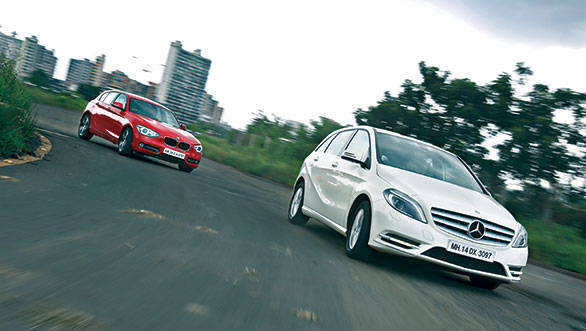 The B-Class looks rich and uses traditional Mercedes design elements. Viewed from the front, the three-point star stands out while the attractive LED parking lights are the best we've seen in a Mercedes so far. The rear is typical Merc and the E-Class like taillights give it a family resemblance. The 1 Series on the other hand is a typical supermini. And even though its not exactly a looker, it still attracts attention, especially if it is red hued like our test number. The side profile isn't the best viewed angle of this car either, the long bonnet and strong shoulder line begins to give the car an athletic look until your eyes focus towards the rear end. It somehow ends abruptly because of the wider door opening and the small, boxy C-pillar. In our opinion, the car is best viewed from the rear three-quarters. Step inside, and both cars are well-built and there is a sense of luxury. The B -Class feels a bit more plasticky than the 1 Series but the design is newer and feels fresh. The 1's interior feels drab and there is nothing that makes you say 'wow' apart from the use of piano black detailing and a hint of sporty red, and this is only standard in the top Sport and Sport Plus variants. To go with the theme, the interiors are all black while the Mercedes focuses more towards an elegant approach with dual tone black/beige interiors and faux wood detailing. The propeller like air con vents in the B not only look the part but are also quite effective thanks to five individual vents in the front. Both cars offer high resolution screens up front with various features. The front seats in the 1 offer great support and come with higher levels of adjustment while the driving position is just perfect. However, despite increasing the wheelbase for better rear cabin space, there is just about enough space for two adults at the back. A high transmission tunnel also means it's strictly a four-seater. There is no centre armrest either and getting in and out of the car is not easy. This is where the B scores over the 1, cabin space is better managed and five adults can travel in comfort thanks to a flat floorboard and better seat support for rear passengers. Since the glass area is larger, visibility is also much better. There are more storage places and because the gear lever is hidden behind the steering wheel, additional room is created. The boot in the 1 Series is quite large for a hatch but then the B still offers more space, the spare tyre isn't placed under the boot and takes up space but one cant complain much because the BMW doesn't even come with one. Despite featuring a large 2.2-litre diesel engine, the power output from the Mercedes engine is much lower than the 2.0-litre BMW motor. The engine puts out 109PS and 250Nm of torque. As expected it doesn't transform the B into a rocket and power delivery is relaxed and linear. The engine however is mated to a seven-speed dual-clutch gearbox that offers quick and smooth shifts. One can choose between three driving modes (economy, sport and manual), and in sports mode, the car crosses 100kmph in 11.6s. However the engine is better suited for cruising and it returns impressive fuel efficiency too. In town the B180 CDI returns 12.6kmpl while on the highway the figure increases to 18.8kmpl. The 1 Series uses the same 2.0-litre diesel seen in various other BMWs but has a reduced power output of 143PS and 320Nm. However, power delivery is surprisingly good, it is linear and there is very little turbo lag too. The sprint to 100kmph comes up in a quick 8.7 seconds while roll on figures are better than the B. The eight-speed torque converter shifts quite quickly and helps achieve this time. It even offers smooth and seamless shifts, in fact it is so good that you'll be fooled into thinking its a dual clutch auto. There are four driving modes and depending on your driving mood the gear shifts, throttle and steering response are altered. We preferred Sport+ mode but the Eco Pro mode is better suited for everyday driving. It is in this mode that the car returns best fuel efficiency  the car returned 11.6kmpl and an impressive 21.2kmpl in the city and highway respectively. An overall figure of 14kmpl makes it only 0.1kmpl less efficient than the B. The BMW 1 Series will go into the history books as the most fun to drive BMW hatchback ever and that's because the car we are driving today is RWD. Yes you read it right, unlike the B-Class and the next generation 1 Series that will roll out in two years time, the 1 Series is the only RWD hatchback available today. This combined with the Sport+ mode makes the 1 Series a delight to attack corners or should I say slice through them, it may be diesel powered but then there is enough torque to be able to go sideways and since you can't completely hack into the electronics, you will be prevented from overdoing it. The chassis is perfectly balanced and weight distribution is 50:50 so it even handles beautifully and stays planted when not sideways. And since it's assembled in India, BMW engineers have even softened the car for better ride quality. The ride is never harsh and it rides over potholes and broken roads without complaint. The B-Class in comparison is no match when it comes to handling and driver involvement, it isn't bad but then the BMW is just better. The Mercedes is a CBU and so the suspension setup works best on European roads and is slightly stiff for India.The B is best driven on smooth roads, where it feels like a typical Mercedes. 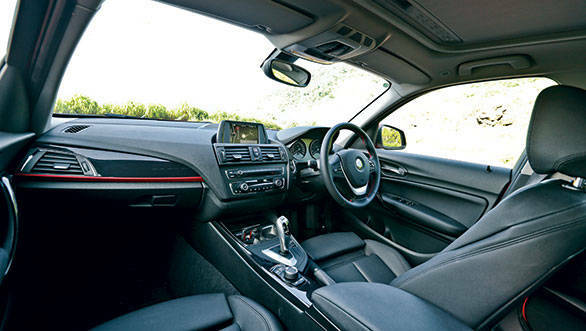 The 1 Series then isn't the ideal car to be chauffeur driven in nor is it ideal if you have a family and grown up kids. It's for that someone who is single and wants a car that is effortless to drive and the same time powerful and a lot of fun. It offers a host of features too, but the top end Sport variant we tested is priced at Rs 29.9 lakh, ex-Mumbai. This is a shocker considering the car is assembled locally and the customer is supposed to benefit from taxes saved. To give you a clearer picture, the B180 CDI, which is a CBU, attracts more tax but can be all yours for Rs 22.6 lakh, ex-Mumbai (and once assembled, it will be even more affordable). Except for a sunroof, the car boasts almost every feature. At this price, it's more affordable than the base 1 Series too. It is the more practical car. 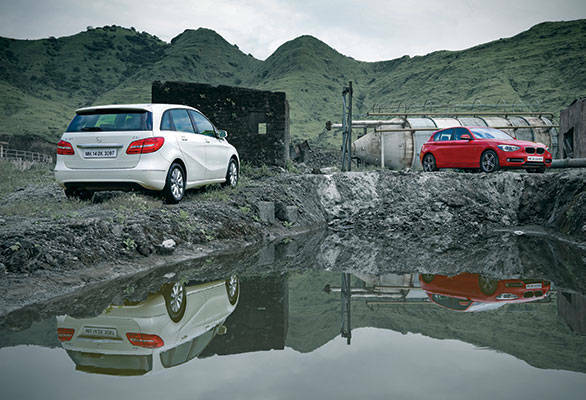 And if you are chauffeur driven, travel with family and space is priority, the B-Class makes for a good choice. And it is in our opinion the better entry-level luxury car to go for.